The most common garage door repair is replacing the garage door spring. Most garage door springs are rated at a 10,000 life cycle, which every time you open and close your garage door is 1 cycle. So the life of a garage door spring can vary depending on how often you open and close your garage door through out the day. So what happens at the end of the life cycle? The garage door spring breaks! This is where We Fix Ugly Doors comes in. We are garage door spring specialists. We can help you determin what the best replacement garage door spring(s) should be. Garage Door Springs are designed to lift over 300 pounds, depending on the size and rating. There are also 2 types of springs. The torsion and extension spring make it possible to open and close your garage door. With the amount of tension in the spring, it is important to make sure the springs are correctly installed. That is why it is always recommended to have a professional replace the garage door springs. They can safely remove and properly install the new springs making sure the garage door works properly. 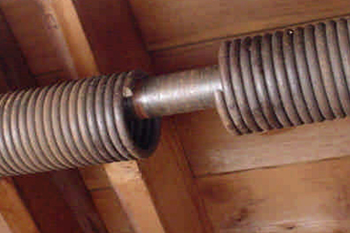 When homes were originally built, one spring may have been installed for the garage, but what is recommended it to replace the one spring with 2 springs. There are a few good reasons why. First, installing 2 springs will increase the life cycle of the springs, because they share the weight of the garage door. Second, if one spring breaks, the second spring would be able to operate your garage door, so you won't be stuck with a broken door. We understand that you just never know when a spring could break when it gets towards the end of it's life cycle. The spring can break in the middle of the night, or in the morning when you are leaving for work. That is why we offer 24 hour same day emergency service. Give us a call and you can speak with one of our highly trained technicians and we can schedule a time to come out that works best for you. FREE Estimates!